Friends, this is not about Christmas displays. It's about tradition. 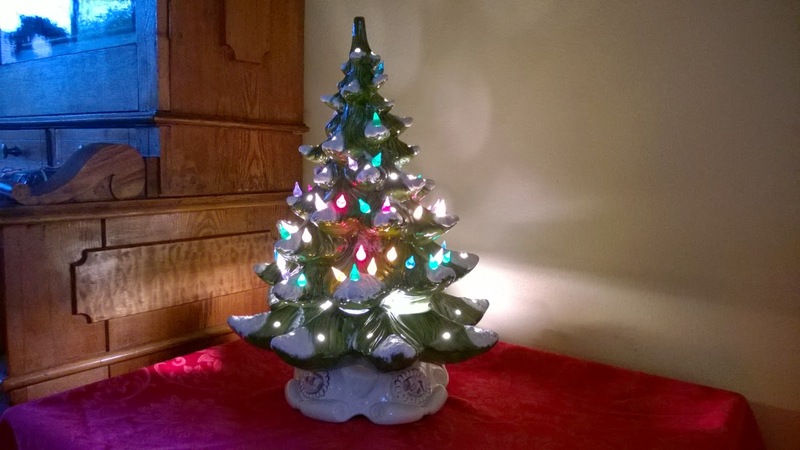 I recall this decorative ceramic tree from 60 years ago. Illuminated and only 20 inches tall, it brought light and joy to my childhood around the holiday season. My mother installed it on a table in the family living room every December. It stood for something—it ushered in the most special time of the year. Now I'm glad to see the ceramic tree in my daughter's living room. Her children (12 and 10 years old) recognize it as a marker of the same special time of the year. Other markers will come along soon: gift giving, gift receiving, visits from the cousins, aunt, uncle and other family members. The tree invites all of us to special family times and seasons. That old tree represents some really good tradition. After shining annually for 60 years, the tree now provides joy to the second, third and fourth generations. Mother would approve. I easily imagine her shedding a tear or two, running down to a smile of joy. Along our lives' paths we are surprised by many changes and challenges, especially the emergence of electronic devices, vast new entertainment options, new diseases and global changes. Where are the directional beacons shining from afar? Traditions are those things and values that endure. I grant that some traditions are just deadly. Let them go but seek and hold to those that shine as beacons toward personal growth, family ties and social justice year after year. If you agree, spread the message by clicking on a share button below. Leave a comment if you wish. A joyous holiday season to you!